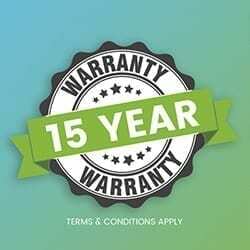 Garden Sheds Gold Coast | HUGE Range & Sizes | FAST Delivery. garden shed on the Gold Coast? Looking to buy a garden shed on the Gold Coast? 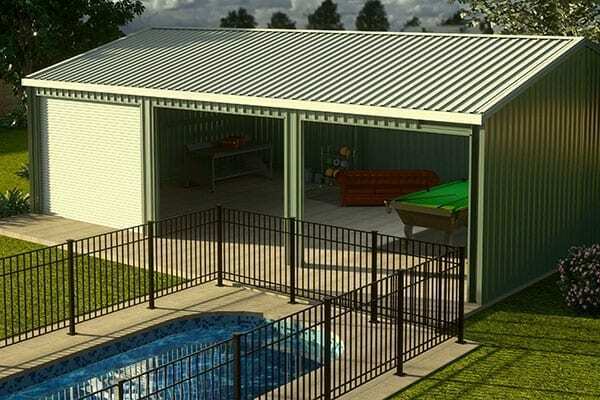 Spanbilt Direct are the kings of garden sheds, bike sheds, storage sheds, carports and garages; and we’re dedicated to producing a great range of steel structures to suit any climate. The Gold Coast is full of an array of different residential properties, from your beautiful beachfront highrise apartments, beachside houses, townhouses and duplexes, through to your larger suburban homes. 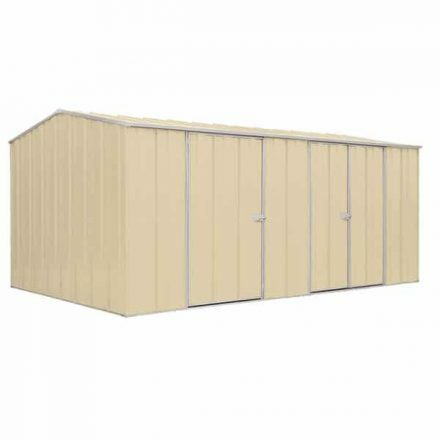 Spanbilt offer a large range of garden sheds and storage sheds that are ideal for all of these properties. 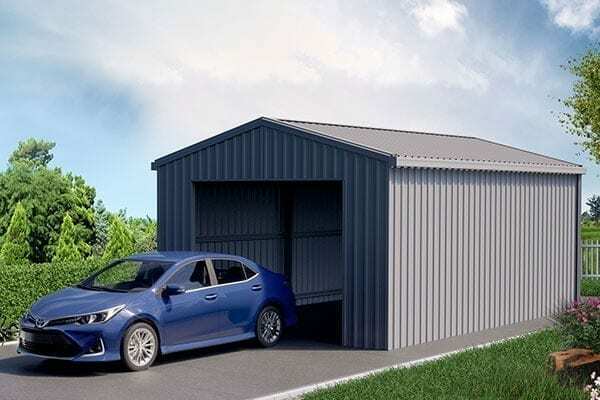 We have a great slimline range of garden sheds such as the Yardstore F42-s and Yardstore F52-s, designed to fit into compact spaces, and are ideal for Gold Coast townhouses and apartment blocks. This great little, flat-roof, garden shed kit is the ideal solution when space is limited. It will fit under most eaves and provide secure storage for gardening tools and more. You’ll be surprised how much it can store – especially if you use some wall shelves or storage hooks. It’s deep enough to hold your mower and big enough to provide secure storage for your whipper-snipper plus heaps of other gardening gear. This great, flat-roof, DIY garden shed kit provides heaps of storage space for the price. You’ll be amazed what will fit inside. The YardStore F52-S Garden Shed is a flat roof , nice-looking and inexpensive slimline garden shed that offers the ultimate garden and home storage solution when space is somewhat limited. 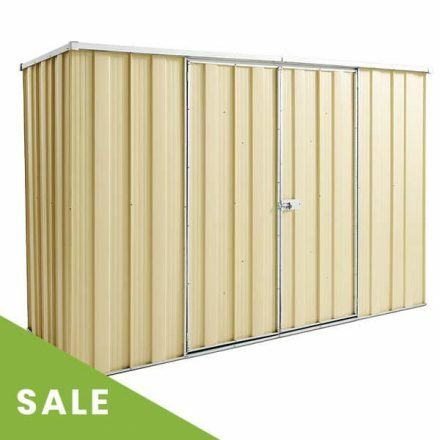 This is a big shed that doesn’t take up your whole back yard … Perfect Storage for Bikes, Mowers, Blowers, Clippers and Snippers … Safe and Secure Storage with a Wide Lockable Pad Bolt Door … A range of colours to suit your backyard and keep your area looking pristine. Aussie Made and Designed Sheds. If you have limited space, this great little, skillion-roof, garden shed could be the perfect solution. It’s small enough to fit under most eaves, tough enough to live under the stars, and big enough to store heaps of tools and other gear. Add some shelves and it’s a mini warehouse! Store your toolboxes, power tools and gardening gear in this great backyard, sloping roof, garden shed. If you keep the floor space clear by using wall shelves and storage hooks, you can even fit a bike in this little beauty, thanks to it’s wide door. Economical, easy to build, Australian made garden storage. A little extra space can make a big difference – and that’s just what this skillion-roof shed delivers. Over a metre in depth – so there’s heaps of room for shelves. It’s amazing what you can fit in here. Compact dimensions, generous storage space, nice big door – what more could you want! Beachside living has never been better than what the Gold Coast has to offer, and with this land quite sought after, you are sure to find developers have made the most of realestate they have. The Gold Coast has a number of properties built on smaller lots, and semi-detached houses and duplexes. 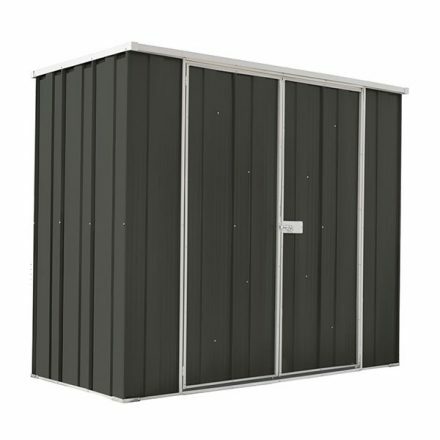 Spanbilt Direct provide for this market by offering a vast medium sized garden shed range. Our designs are large enough to store all of your valuables, small enough to be neatly built into your property. Ideal Storage for … Apartments and Townhouse complexes Under eaves and/or down the side of your property. Secure storage and organisation for the carport or garage Gardening Gear Lawnmower Tools Bicycles & Cycling Gear. This DIY kit is big enough to store your mower, blower, wheelbarrow, whipper-snipper and more. You could probably keep all your gardening gear, tools, and hobby gear safe and sound in this great, gable-roof, garden shed. The extra-wide single door makes access easy. Need lots of outdoor storage? For your gardening gear and mower? Camping gear? Tools and painting gear? You’ll probably fit it all in this big, gable-roof, garden shed. Yes, we have bigger sheds, but if you add some wall hooks and shelving, you’ll be surprised how much fits in this one. Here’s the baby of our ‘big shed’ range – a beautiful baby, with a gable roof and extra-wide single door! You’ll be able to keep all your power tools, gardening gear, pool gear and hobby gear nice and secure in here. Need a great ‘big’ shed? Here’s your baby. We offer both Home Deliver ($77 for this product) or FREE Click and Collect. Ideal Storage for … Apartments and Townhouse complexes Under eaves and/or down the side of your property Secure. storage and organisation for the carport or garage Gardening Gear Lawnmower Tools Bicycles & Cycling Gear. For those living in larger residential homes, Spanbilt Direct offer a great choice of larger steel garden storage solutions. Our manufacturing facility is located only 40-minutes from the picturesque Gold Coast, and you can be rest assured you will receive FAST delivery. We also have a number of depots located throughout the Gold Coast. What are you waiting for? 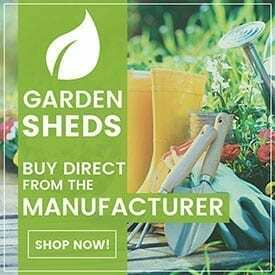 Purchase your garden shed online today! 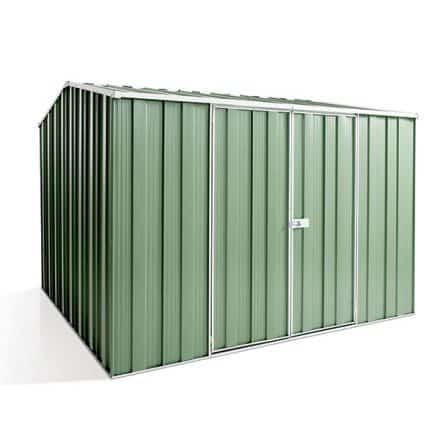 This is the ‘Big Daddy’ of DIY metal storage garden sheds. You can park your ride-on mower in here – right next to the gardening gear, power tools, camping gear, pool toys, surfboards and the kids’ bikes. Why clutter up your house or garage – get it all out of there and store it in here. Ideal for the medium sized backyard … it’s practically like adding a new room to the house. In most cases, buildings with less than 10 square metres roof space will not require council approval, however, it is in your best interest to contact the Gold Coast city council to double check. You will also need to check to make sure that your estate does not have a covernance that restricts your colour selection and size. Every council is different – however, they should be able to give you advice over the phone. View our video on Council Approval and Garden Sheds.